Producers are busy people. We juggle multiple projects: we’re in the middle of Project A when Project B ends and Project C gets started. We often don’t take the time to fully prepare new projects before we start them, especially when it comes to creating the production workflow! We then discover, sometimes well into the project, that we have backed ourselves into a corner without access to content, don’t have proper backups and safeties in place when trouble strikes, or cannot properly scale our project as it becomes successful. This document guides you through questions that will prepare your project for a smooth workflow. You can apply it to projects that have not yet begun, or use it as an opportunity to review an existing production process. As a bonus, answering all of these questions will get you started in documenting your workflow for future reference! Who are the key players and what are their roles? The entire team must understand their role at each step of the process. Does someone own the vision and editorial leadership of the project? Who is the funnel to keep the project focused? Where do the ideas start and how do you determine content? Think through the very beginning of your content decisions. How do you create a safe space for generating and sharing ideas? Will you have pitch meetings? Who makes the final editorial call? It may be helpful to track ideas over time for future reference. What are the key milestones? Sketch each milestone in a rough flow chart. When is the first piece of audio created? Edits and revisions — how many and when? What needs a deadline? Are deadlines firm? Will they be respected? What is the schedule for the final 48 hours prior to release? How will you avoid “crashing”? Ensure there are buffers of time in the calendar in case of interruptions. Create checklists for each milestone. How will you know when each milestone is complete? 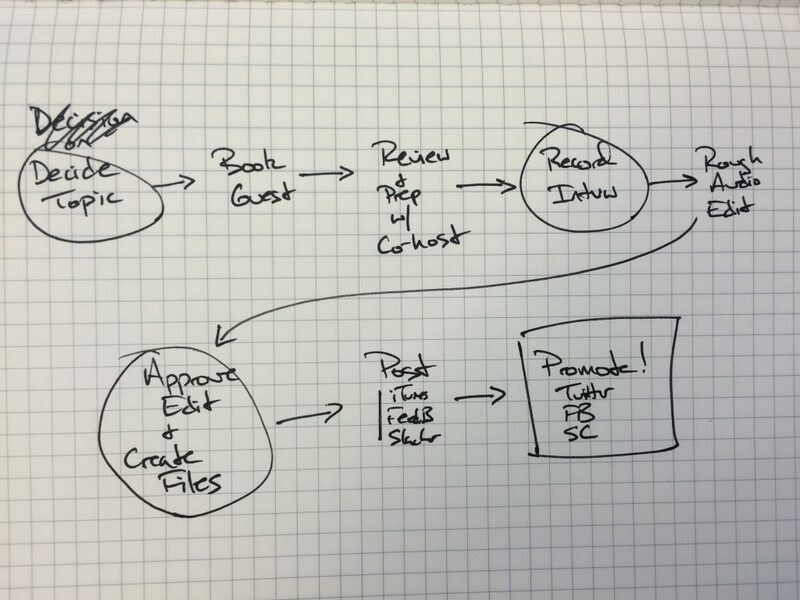 Very rough sketch of a simple production workflow. Where do you anticipate obstacles? Every production has obstacles of some sort, from delays and decision-making to working remotely. Think through the potential obstacles and how you will deal with them. Sketch out a communication plan to keep in touch with the key players and the team. What needs to be communicated? When, to whom, and how? How will you keep notes on each production for future reference? Taking good notes through each step of the production can be helpful at a later date if you need to reuse material or revisit a topic or guest. Save and organize any research materials, transcriptions, or production notes created in the making of each episode. A good workflow is built around the needs of the production and the team, not the tools! However, determining your tools in advance — instead of in the moment — ensures you can hit the ground running. It can also help raise questions about efficiency, access, communication, etc. Avoid changing your ideal workflow to meet the limitations of tools. What tools will you use for audio, scripts, calendars, communication, storage, documentation and archiving? Are the tools collaborative? Do they need to be? Will anyone on the team use personal tools like laptops and other hardware, personal accounts, or licensed software? What obstacles will that present? How will you organize data like audio and scripts? Think through consistent folder structure, filename conventions, and version tracking techniques. Tools like Dropbox and Google Drive can make access and backups much easier but require organization. Music licensing can be confusing. Where will the music come from, do you have permission to use it, and do you need to track usage? People – if a key player is unexpectedly unreachable, how can someone else easily pick up the work with minimal training or communication? Where are there opportunities for training? Media storage – how will you arrange for multiple points of storage for your media? Tools – if a crucial tool breaks, what are your alternatives? Brainstorm an alternative for each tool. What (everything or only finished products? ), when (during production or at end of production? ), where (what storage mediums? ), why (what is the archive for? ), and how (who does the archiving?). Where can you use templates? Think through your workflow and find opportunities for templates to create efficiencies and standardize workflow. Audio editing software is often a good place for templates. Form emails to prospective guests, script outlines, and production credits can often use standardized language. How will you document the workflow for future reference? You may need to reference the workflow or communicate it to someone else in the future. Is the workflow simple enough to be memorable? Test whether or not the workflow is easily repeatable. Can you talk about it fluidly without looking at documentation? Can other members of the team sketch it on the back of a napkin? Ask: What’s working? What needs adjustment? What have you learned since the last review? Make sure you and the team can still sketch an overview. Once you have worked through these questions, keep up the momentum! Document your answers and store them (or better yet, display them) in a way that is easily accessible for your whole team. Continually review the processes, and don’t be satisfied with the workflow until everyone is comfortable. A printable copy of this document is available: Be Prepared. Big thanks to the following folks for their help and advice putting this document together: Michael May (NPR), Steve Nelson (APM), Michael Raphael (WNYC), Casey Herman (NPR), Ramtin Arablouei (NPR), and Emily Kwong (KCAW).